A few weeks ago, I paid a visit to St Etheldreda’s Church in Ely Place to take some photos, but alas – most of them were rather dire, so I went back again last weekend to try again. St Etheldreda’s Church was the town chapel of the Bishops of Ely from about 1250 to 1570. 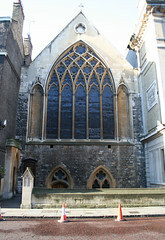 It is the oldest Catholic church in England and one of only two remaining buildings in London from the reign of Edward I. It was like an independent state, the Bishop of Ely’s place in London or Ely Place as it is now called, and its chapel took its name from one of England’s most popular saints of the day, Etheldreda. The church was built in 1290 by John De Kirkeby, Bishop of Ely and Treasurer of England under Edward I. Why did the Bishops of Ely come to London and particularly Holborn? Well, first of all, a member of the diocese had bought a piece of property here with the idea of building a little oratory, but then, in the middle of the 13th century, when parliament was called, it was necessary for the Bishops to come to London, so they needed a residence and so the Bishop of Ely built himself a great palace. John De Kirkeby died leaving his property together with its liberties to the successors of the See of Ely. The whole estate was administered by the See of Ely and was outside the jurisdiction of the City of London. From 1316 were added a palace, orchards, vineyards, gardens and ploughlands until it spread over an area of 58 acres. During the Civil War, in 1642 Parliament requisitioned Ely House and Chapel as a prison and hospital. An Act of Parliament in 1772 enabled the Bishop to sell the property to the Crown. The Crown in turn sold the freehold site to a Mr Charles Cole, architect and surveyor. He demolished every building but the Chapel and on the vacant ground in 1775 built the present Ely Place. Even at the beginning of the 20th century, Ely Place was still under the jurisdiction of Ely, Cambridge, and not part of London. You enter the church via a narrow corridor which runs the length of the church, and then up a short flight of stairs to the massive wooden doors which lead to the church interior itself. 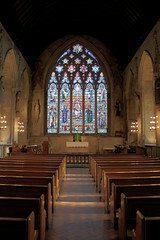 At the rear of the church is a raised gallery with the customary organ, and a large stained glass window which was installed after the original was destroyed in WW2. Facing the alter you can see that the walls are lined with stained glass windows and a series of statues of notable Catholic figures from history. Then look down on the congregation and being painted and in the gloom, it is slightly unnerving to have this fairly realistic characters watching you as you progress down the aisle. Ahead of you is the main stained glass window – which is claimed to be the largest in London. There is also an undercroft which I was able to pop into briefly to take a few photos while it was being prepared for what looked like an evening dinner event. It is a quite lovely church to pay a visit to and very decorative once you get inside. A short history booklet is sold which goes into quite a bit of the extensive history of the church. I thank God I have the privilege of being baptized a Catholic and honour that beautiful gift with humility and deep gratitude. And by bragging about it on websites.